Cavalor Muscle Force is a 100% natural supplement, formulated to support & improve your horse's natural muscle development. You should notice a difference after only 2 weeks, with maximum result after 6 weeks. 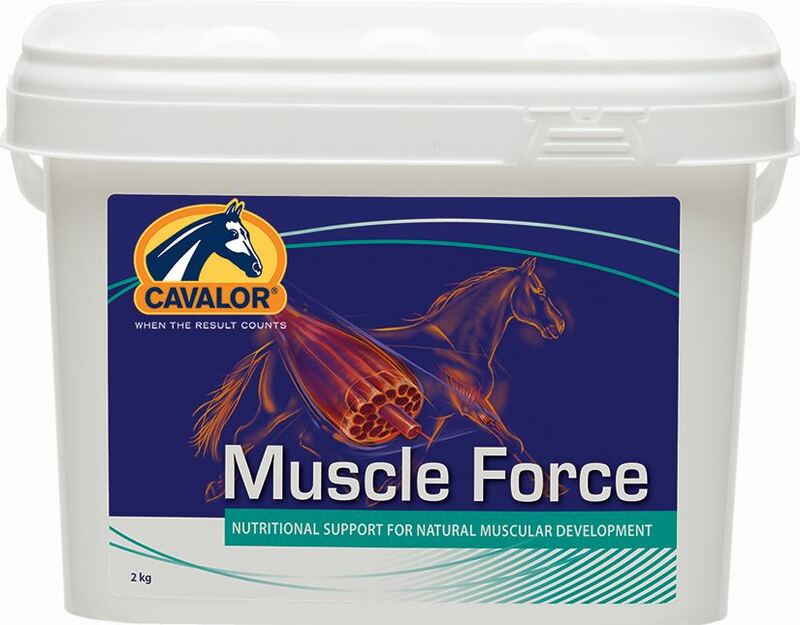 Cavalor Muscle Force contains amino acids (the building blocks for protein & therefore muscle), probiotics & a specially chosen blend of herbs; all of which combined, help to build up muscle & reduce breakdown of muscle cells. Cavalor Muscle Force is ideal for horses who are being brought back into work after a break, or young horses being broken in, or any horse lacking muscle. For optimum results, feed in conjunction with an appropriate training program. Myostem Mass is a nutritional supplement from Audevard, that contains high levels of essential amino acids & is ideal for supporting muscle growth. Equitop Myoplast is a top quality muscle building & maintenance supplement, which will help improve performance. It contains 18 amino acids (the building blocks for protein & muscle) including 4 essential ones, that can only be obtained from the diet. Equistro Excell E is a liquid formulated to support your horse's muscle function & health. It is ideal for horses in hard work who put increased demand on their muscles, or those who are prone to muscle stiffness. Cavalor Muscle Fit is a comprehensive, high quality supplement that has been formulated to improve and maintain muscle suppleness and flexibility. It is ideal for horses in hard work or those who are prone to tying-up (azoturia) or muscle inflammation. Helps bulk, definition and strength. For hard keepers, young horses and horses in training. The professionals choice for safe and natural muscle development. Muscles Matrix 100% organic blend contains triterpenes compounds that react at the cellular surface sites within the muscle tissue to support muscle development. Supports elimination of the harmful byproduct of exercise therefore helps better recovery. Supports muscle, nervous system and normal circulation. Give your horse the competitive edge. Help energy levels and support recovery time. A unique blend targeted to improve exercise capacity. Matrix Performance helps support normal cardiac output, circulation and normal blood cell health. Recovery is important to your horses health after training or competition. Helps sluggish horses.